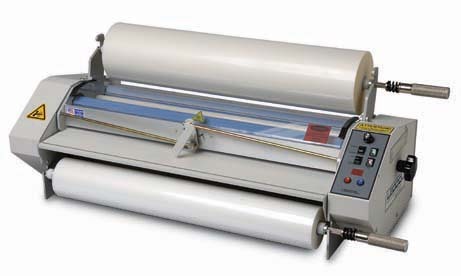 27" Ledco Professor Heated Roller 2-side Roll Laminator in 110 volt can also mount & laminate up to 3/16" thick, and now with 2 year warranty. The Ledco 27" Professor heated roller roll laminator has been engineered to provide years of service with minimal maintenance. It's capable of laminating films up to 10 mils thick on both sides and thermal mounting up to 3/16" thick materials. Has heated rollers for a non-scratch film application. Large 2-1/4" heated rollers for thermal mounting up to 3/16" and capable of pouches or pouchboards too.